There's been little posted by us recently but that doesn't mean we haven't been busy. Here are a few of the things we have been working on. Nigel’s Britannia uses 13mm Association drivers and bearings soldered into the Dapol bearing tubes. The front bogie will be replaced and use 6mm Association wheels while the pony truck and tender wheels will be turned down. Main coupling and connecting rods will be changed, but the rest of the valve gear will be original. Nigel’s Duke is mainly N/S sheet on top of a milled brass chassis. The boiler will stay hollow to help weight distribution. The tender is a John Birkett-Smith 3D print on top of a scratch built chassis with a Maxxon coreless motor. Fly cranks are secured onto the wheels using 16ba bolts. Some BR GUVs I have been detailing with my etched brake shoes plus footsteps to backdate the blue versions to their pre-1972 state. One end step is still attached and just visible but a better method of fixing is needed. They are in the process of being weathered. A BG and heavily weathered GUV. The aim was to replicate one of those vans where you couldn’t quite tell what the livery was. I suspect it is just about due for it’s first coat of Rail blue. The BG is looking shabby but not quite as decrepit. Alan’s thatched cottage was built from a photo in a calendar with estimated measurements and was built to help improve his modelling of thatched items. It’s already looking very good though he is continuing to make improvements. 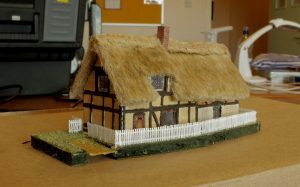 David’s platelayers’ huts, one in etched brass from a Severn Models kit and the remainder scratchbuilt from styrene and (very thin) Ambis corrugated roofing. The grinding wheel for sharpening scythe blades is scratchbuilt from wood, plastic sprue and brass wire. David’s Thorneycroft lorry from a Dornaplas kit with computer printed lettering and horse drawn milk float and trap from Shire Scenes kits. David acquired this unfinished conversion of a Farish 4F at the recent supermeet at Tutbury. Built by Phil Kerr in the traditional style (brass frames separated by tufnol blocks) it needs a little attention.